Preheat oven to 180°C. Line a baking pan with a piece of baking parchment paper. Mix everything in a bowl except mozzarella cheese. Mix until everything well combined. Shape the mixture into 2 inch meatballs. Make a hole with your finger in the middle of the meatballs. 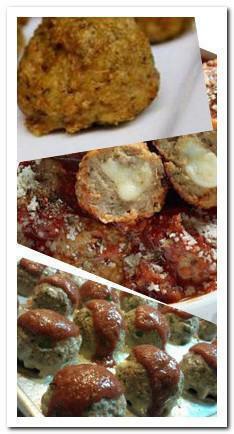 Stuff a cube of mozzarella cheese into the hole and seal the hole by forming it into meatballs again. Place the meatballs in prepared baking pan and bake in the oven around 20 minutes or until meat is no longer pink. These meatballs are delicious. A dollop of melting cheese wrapped inside well seasoned ground meat. It is a nice appetizer, or making sandwiches with these meatballs or serve it with pasta.